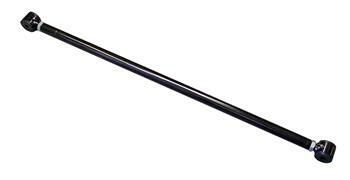 Improve handling and traction on your vehicle by upgrading your flimsy stock pan hard rod with the adjustable Hotchkis Panhard Rod. Panhard Rods positively locate the rear axle and control lateral, side-to-side movement. The Hotchkis Panhard Rod features greasable bushings, grade 8 hardware, tig welded construction and a durable powder coated finish.